Austria is a federal republic and a landlocked country of over 8.7 million people in Central Europe, bordered by no less than 8 countries. To the north by the Czech Republic and Germany, to the east by Hungary and Slovakia, to the south by Slovenia and Italy, and Switzerland and Liechtenstein to the west. The heritage of a once united Austrian-Hungarian Empire can be seen in the influences and interconnectedness of these now independent countries, that cooperate and develop together to this day. The territory of Austria covers 83,879 km2 and the terrain is highly mountainous, lying within the Alps. Austria consistently ranks high in terms of GDP per capita, due to its highly industrialized economy, and well-developed social market economy. In addition to a highly developed industry, international tourism is the most important part of the national economy. Germany has historically been the main trading partner of Austria, making it vulnerable to rapid changes in the German economy. Since Austria became a member state of the European Union, it has gained closer ties to other EU economies, reducing its economic dependence on Germany. Membership of the EU has drawn an influx of foreign investors attracted by Austria's access to the single European market and proximity to the aspiring economies of the European Union. Growth in GDP reached 3.3% in 2006. At least 67% of Austria's imports come from other European Union member states. The influence of the once united Habsburg Austro-Hungarian Empire is visible in the still remaining economic, social and cultural cooperation of Austria with its neighbors. Austrian Startups: "We promote and support startups in Austria"
The Austrian startup community is well organized. AustrianStartups could be considered as their leading organization, with working representatives in all federal regions. It is a neutral, independent and non-profit platform of, by, and for the Austrian startup community to increase its visibility and strengthen the entrepreneurial ecosystem. It is an open place for all startups, stakeholders, and interested persons, who are all encouraged to launch joint initiatives with them. 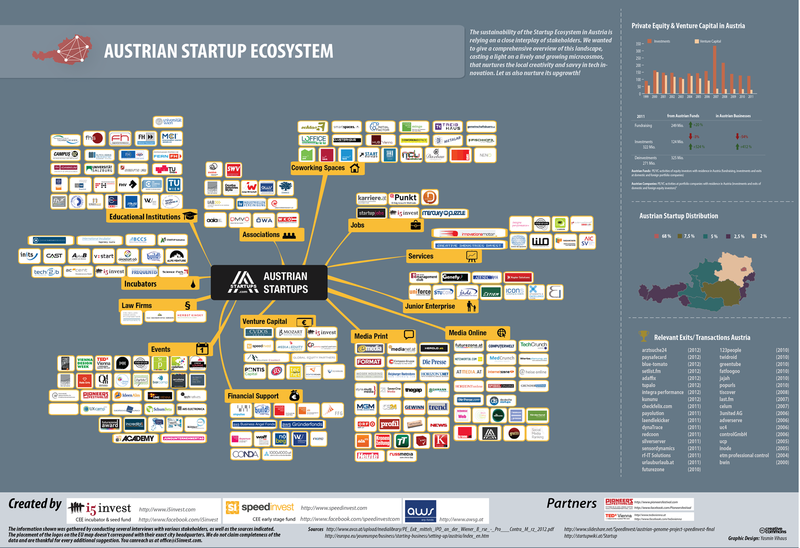 You can see the graphic of the Austrian startup ecosystem on the link.